Naved Hamid is the Resident Director for IGC Pakistan. 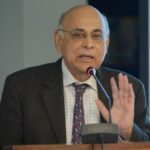 Naved Hamid is Director at the Center for Research in Economics and Business (CREB) and Professor of Economics at the Lahore School of Economics in Pakistan. Naved is also a member of the Macroeconomic Working Group for the Government of Pakistan as well as Chair of the Working Group on ‘Export Competitiveness and Growth Strategy’ for the tenth Five Year People’s Plan, constituted by the Planning Commission for the Government of Pakistan since 2009. He was previously the Principal Economist at the South Asia Regional Department. Naved received his Bachelors degree from the Government College in Lahore before gaining another from Cambridge University. He received his PhD in Economics from Stanford University.